optimal efficiency and maximum effectiveness            offices, libraries, restaurants and hotels. now with HEPA level filtration. Ergonomic and comfortable fit for all sizes. 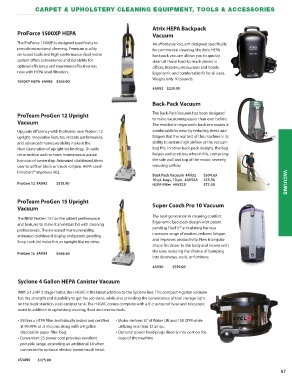 Vacuum                                                  to make vacuuming easier than ever before. user to airflow block or brush roll jam. HEPA Level     reducing airflow. The next generation in cleaning comfort. into doorways, walls, or furniture. wand in addition to upholstery, dusting, floor and crevice tools. at 99.99% at .3 microns along with a 4 gallon   utilizing less than 12 amps. connected to optional electric power brush head.